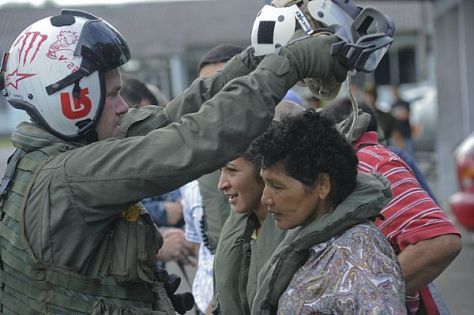 Cpl Brice Millier helps a local put on her cranial to ride the helicopter to the ship, locals are transfered to the ship for surgery that is done by the medical department. USS Iwo Jima (LHD 7) is currently off the coast of Guatemala in support of Continuing Promise 2010 humanitarian civic assistance (HCA) mission. The assigned medical and engineering staff embarked onboard Flagship Iwo Jima will work with partner nation’s teams to provide medical, dental, veterinary, engineering assistance to several different nations to improve mutual understanding of current medical issues and technology.